I was inspired to have a cake stall when the Gifts of Grace catalogue arrived in the mail. I wanted to buy them all! I added up the total cost, and it equalled $2368.00. That was my goal. There would be no stopping me now – I just needed to figure out a way to raise money. a cake stall out the front of our house. Mum agreed to my plan! We got to work, cooking and making posters. The cake stall began! Lots of customers came to buy cupcakes, cinnamon buns, chocolate slice and brownies. Customers and more customers. Money and more money. At 5.00pm we sold out, and packed up. Then it was time for the grand count! Our total was … $130! Not bad for 90 minutes! After we had cleaned everything up, mum was discussing what to have for dinner. She said, ‘I don’t have much time left to cook dinner because of all the cooking we have already done today’. But I told her: ‘At least we made a difference to the world, Mum!’. 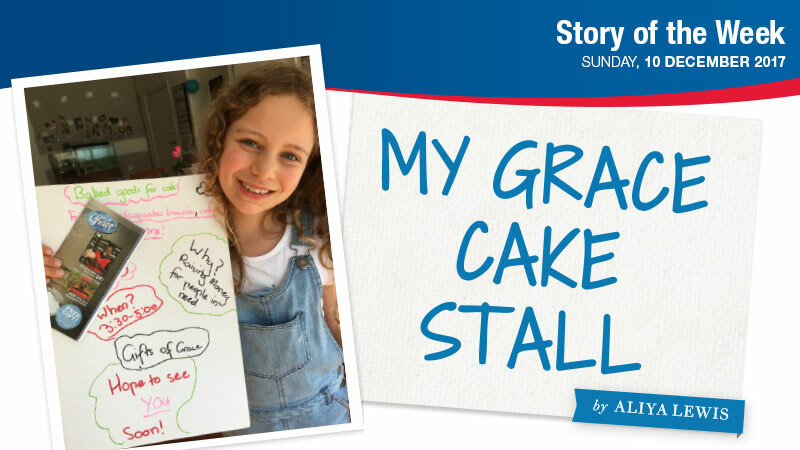 Aliya Lewis is a 9–year–old Gifts of Grace supporter from Victoria. Gifts of Grace is an ALWS idea to divert some of the $48 billion Australians will spend on Christmas this year to helping others. From a pineapple patch in Burundi to welcome meals for refugees in Kenya, there is a wide range of ways to help bring love to life. 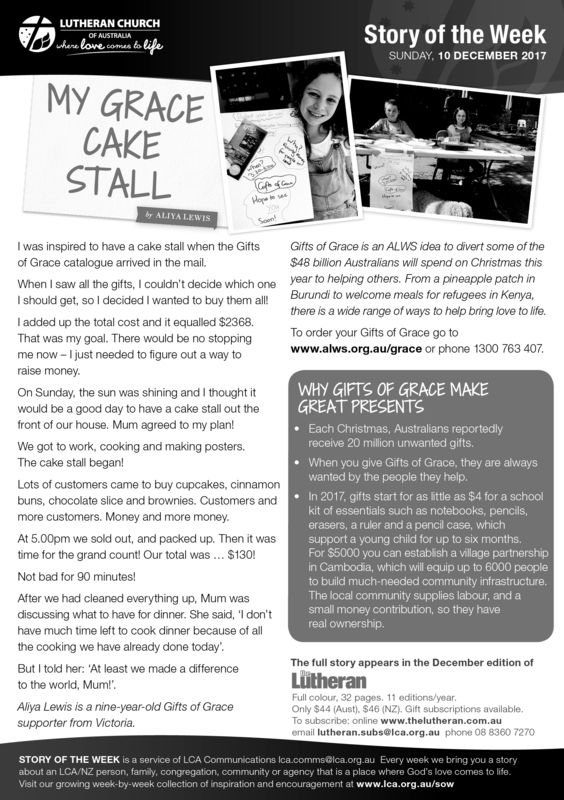 To order your Gifts of Grace go to www.alws.org.au/grace or phone 1300 763 407. Each Christmas, Australians reportedly receive 20 million unwanted gifts. When you give Gifts of Grace, they are always wanted by the people they help. In 2017, gifts start for as little as $4 for a school kit of essentials such as notebooks, pencils, erasers, a ruler and a pencil case, which support a young child for up to six months. For $5000 you can establish a village partnership in Cambodia, which will equip up to 6000 people to build much-needed community infrastructure. The local community supplies labour, and a small money contribution, so they have real ownership.